At our church, we are beginning a preaching series through the Book of Judges. My co-pastor suggested we brand the sermon series, “With heroes like these, who needs villains.” If you’re familiar with Judges, then you get it. But we are preaching through this book because we don’t want to forget that God’s grace often shines brightest against the darkest of backdrops. 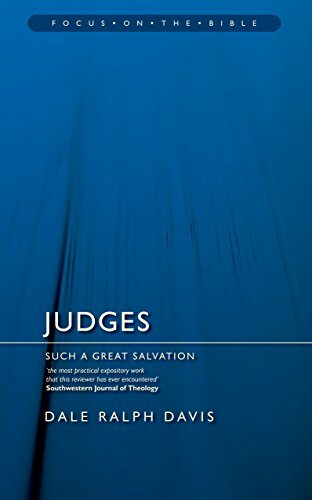 While doing preliminary research, I came across the below quote from Dale Ralph Davis in his Judges’ commentary, Judges: Such a Great Salvation. The quote comes in the context of Davis’ treatment of one of the main objections secular people (and others) raise against the Book of Judges, namely, the morality of the conquest of the land of Canaan by the Israelites, especially because the Lord commanded the disposition. Or, in short, the objection says, “holy wars” were always—and are always—wrong. This objection is not unique to The Book of Judges but it is prominent here, as it is in Joshua. Consequently, commentators typically address it, but often, it feels, they do so reluctantly and only out of necessity. Thus to readers, it often feels as though the author would have preferred to tiptoe around the topic, or perhaps that he was sent unwillingly by an editor on a mission to rescue God from bad PR. Regardless, I can understand why. In a day when theists strap bombs to themselves and others murder abortion doctors in the foyers of churches, God’s OT land acquisition program needs a careful explanation. Yet being careful is not the same as tiptoeing. And Davis won’t be found guilty of the latter; he approaches the objection with his typically fresh, unapologetic, and punchy style—a style I first experienced in his book on preaching Old Testament narrative texts, The Word Became Fresh (which I intend to post a full book review of later this summer). To be sure, Davis’ comments are not the final word on the subject of holy war in the OT, but they certainly are a good first word. For many readers Judges 1 raises once more the so-called moral problem of the conquest. How horrid that Israel butcher innocent Canaanites, wreak havoc and misery, grab their land – and all, allegedly, at Yahweh’s command! If only the Canaanites could know how much emotional support they received from modern western readers. And the conquest was frightful. But people who bemoan the fate of the poor Canaanites don’t view the conquest from the Bible’s own perspective. They forget one vital fact: the Canaanites were not innocent. Moses was emphatic about that; he humbled the Israelites by insisting that Yahweh was not giving them Canaan because they were such godly folk but because the Canaanites were so grossly wicked (Deut. 9:4-6). If you want all the glory details, see Leviticus 18:6-30 and Deuteronomy 18:9-14. These tests show that the conquest was an act of just judgment upon a corrupt and perverted people. The Bible, of course, does not claim the conquest will be palatable; but it does insist it was just.